At Tutor Doctor, we understand that there are two components to academic success: academic knowledge and academic discipline. Since every student is unique, we customise our approach to help your child develop the expertise and skills they need to unlock academic excellence and future success in life. That’s why we integrate a unique plan for success into every enrollment and coach students through the process. This allows an opportunity for students to develop the required executive skills or “X-Skills” that studies show are essential to every student’s academic success, especially in middle school and beyond. to unlock academic excellence and future success in life. 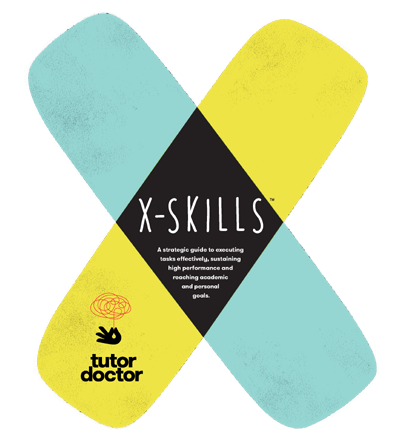 X-Skills are vital for your child’s educational progress and every aspect of life—from getting a job to being successful in their favourite hobbies. We understand the frustrations that come with trying to learn a challenging subject without the right tools. That is why we work with students to build the necessary skills for them to excel while reinforcing the curriculum they learn in the classroom. All of these X-Skills are incorporated in our unique game plan, which is designed to help each student become an academic champion! From mathematics to exam preparation, your child can tackle any educational hurdle when they master these X-Skills with the help of our tutors. Junior secondary school students and above integrate the X-Skills Game Plan under the guidance of their tutor, who acts as an academic coach to explain concepts, as well as motivate the student, and challenge them to exceed their own expectations. The Game Plan is a tool which provides a straightforward, yet powerful process to proactively organise the student’s academic and extracurricular commitments, prioritise their tasks, and develop a plan of execution which leads to overall success without compromising the quality of their life. Once implemented, using the Game Plan leads to the most efficient tutoring sessions in the industry and guides the student to develop the X-Skills that will contribute to their overall success in school and in life.